This does not augur well. If they ever give me another one of these terrible machines I shall set fire to it on the first night and then report it stolen. 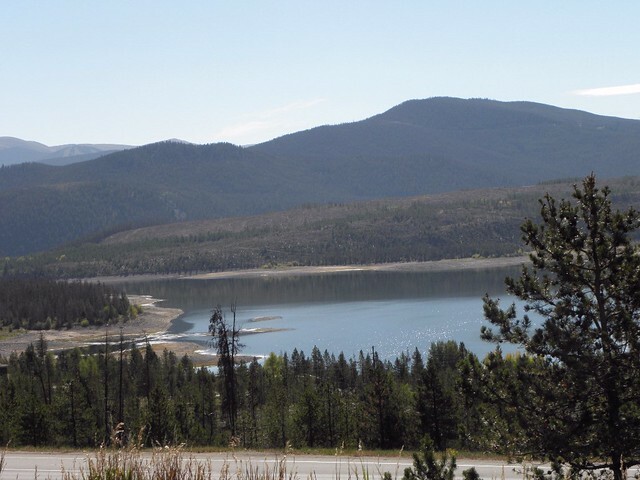 The brakes had at least returned to normal for the descent of Vail Pass and the astonishing Glenwood Canyon - see last year's report for details. It wasn't really warm enough to take the roof down until lunchtime. "You'll need sunscreen" said a passing hippie with whom I had been chatting after he'd ponced a fag off me. He was right; however the problem arose ten minutes later when some of the wretched stuff dripped off my forehead and into my eyes. 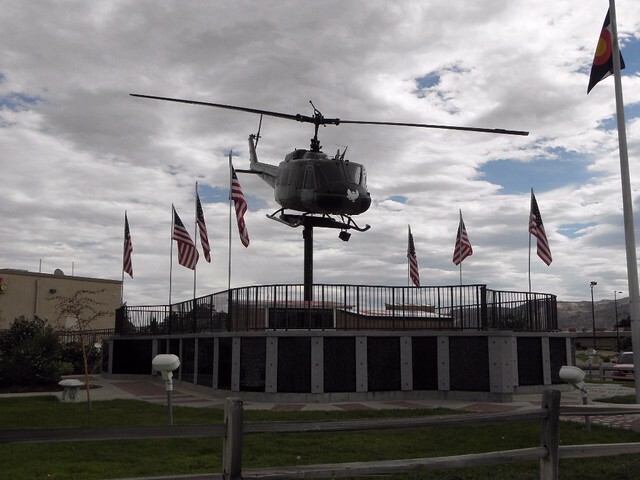 I had to do about forty miles barely able to see before finding the Western Slope Vietnam War Memorial Park, where I could sit blinking until vision returned. Anyone attempting to follow these peregrinations on a map will have noticed that Fruita is a fair way west of Grand Junction. This is because I had decided to press on to Moab - it had been way too early to check in anywhere in Grand Junction. The last time I came through Moab, which I think was in 2010, I found UT-128 - a far nicer way to get to I-70 than US-191. The latter is full of tourists going to Arches and/or Canyonlands National Parks. Unfortunately I was unable to locate the correct exit from I-70 this time, so instead of the Colorado flowing through a spectacular red sandstone gorge, the most exciting sight on offer on US-191 was a motley collection of Depart of Transportation types and assorted law enforcement officers, all inspecting the mortal remains of an eighteen-wheeler which had gone off the road on a very gentle bend and was now lying umop-ap!sdn in the ditch. I just hope no-one got hurt. And so to Moab,which hav a very interesting history if you are interested in hist. which few boys are. Its fortune originally came from uranium mining, but now it's a haven for Rugged Outdoor Types indulging in such perversions as mountain biking, rafting, shydiving and driving around the place in huge and noisy 4x4 which have been jacked up so high that in my current state of fragility I should need a stepladder to get aboard. Tomorrow I intend to find some Corners for the first time this year and I suspect that the experience will be less fun than the same road was in 2011. Bah! Well, there's that old saying, if Daimler can't sort it out, no-one can. Or something. And I was told that Fiat is short for Fix It Again Tomorrow. Good luck with the corners.